I grew up in Iowa, so I’ve spent a fair amount of time around farms. I’m well acquainted with tractors, silos, red barns and fields as far as the eye can see. So when I walked into a greenhouse recently for a story I was shooting about a very different type of agricultural production — aquaponics — I had to pause a bit and just take in the scene. As you walk into Ouroboros Farms, you’re greeted by six big, round bubbling tanks filled with thousands of fish, which are mostly catfish and a few koi. Beyond the tanks are a series of long troughs covered by hundreds of “rafts” with all sorts of dark leafy greens sprouting out. Tanks and troughs, fish and plants, are all connected by a complex pipe system. The fish feed the plants, and the plants clean the water for the fish. It was a quite a place: I swear you could hear the plants growing. 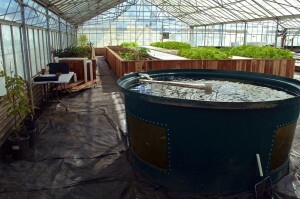 Ouroboros is one of a few large-scale commercial aquaponics operations in the country. That makes the place fairly unique, but there’s another interesting story unfolding under the same roof. A new nonprofit called SchoolGrown is operating an aquaponics “classroom” right next to the commercial operation. SchoolGrown was started last year by a group of like-minded aquaponics enthusiasts who felt that students weren’t getting enough hands-on experiences growing food and learning about their connection to the world around them. The organization now hosts monthly workshops for adults and field trips for kids. They have a group of committed volunteers who help maintain their aquaponics system and harvest the produce. They even treated me to a delicious lunch during my visit: a freshly picked salad and catfish from their tanks. But their big focus now is on spreading aquaponics systems to schools around the country and teaching sustainable agricultural practices. 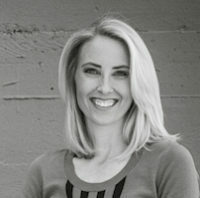 “Farming is no longer about how to use a shovel and a rake,” says SchoolGrown Co-founder Sundown Hazen. “It’s about how to run a robot, and work the Web. Co-founder Sundown Hazen, who worked for 10 years at an Apple store in the Bay Area before starting the organization, says he was motivated in part because he wanted his own four daughters to be more aware of where their food comes from. And he felt that was something they might not get as part of their education. Hazen and co-founder Jon Parr, an engineer and aquaponics “guru,” decided that school gardens needed to be, in a sense, financially independent; they needed to make money and remove the burden of the school having to fund and care for them. That can’t be done with just a few tomato plants and several heads of lettuce, which is often the scope of most school gardens. You need a lot of produce, and people willing to buy it. So Parr got to work. 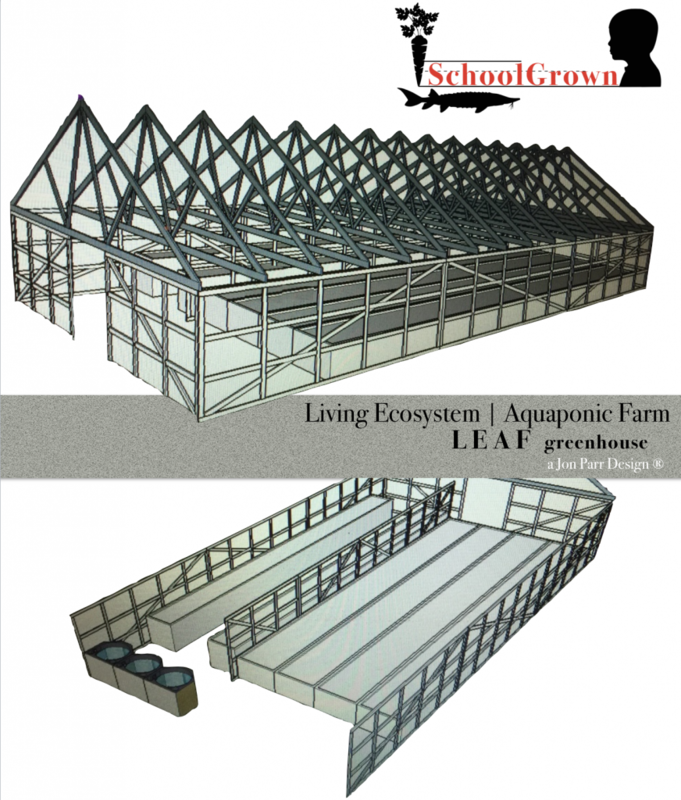 He designed a 30 foot by 60 foot greenhouse, called a “L.E.A.F” (living ecosystem aquaponics facility) greenhouse, that houses an aquaponics system capable of producing roughly 1,000 pounds of produce a week. That’s a lot of valuable veggies. But the system is costly to setup — $75,000 to get the greenhouse up and running. That includes everything from building materials to fish, seeds and even solar panels on the roof. The $75,000 also includes salaries for two part-time staff who would be in the greenhouse for four hours twice each week. Hazen says those workers will be the ones responsible for maintaining the system and harvesting, with the help of the students and staff. 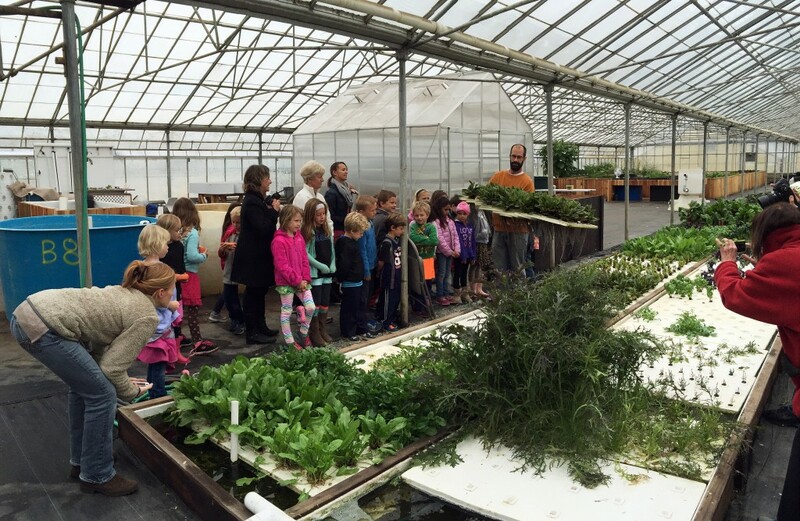 In addition to the advantages of working in the greenhouse — learning about fish and plants and their unique partnership in aquaponics systems — Hazen says that schools can use the farming system to teach about many STEM — for science, technology, engineering and math — concepts like biology, math, chemistry and engineering. It even offers history lessons: A number of ancient cultures used aquaponics systems to grow crops. Hazen and Parr have an even bigger goal for their project and related educational outreach programs: They want to inspire a new generation of farmers. A recent study found that there are more than 57,000 jobs available annually in agriculture, and only about 35,000 graduates with the training that would qualify them for those jobs. Hazen has seen those numbers and thinks students could benefit from the training they would get working on aquaponics systems. SchoolGrown’s first L.E.A.F. greenhouse will be built next month at San Lorenzo Valley High School in San Lorenzo, California. And the team will be traveling to Alaska soon to meet with a school hoping to build a system there in the coming months. Learn more about SchoolGrown at their website.